Imagine Dragons frontman Dan Reynolds has had one hell of a year. 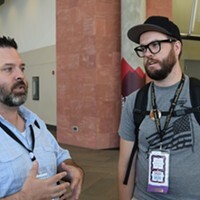 In January, his new documentary, Believer, debuted at the Sundance Film Festival, wowing crowds with its insightful look at how LGBTQ youth intersect with The Church of Jesus Christ of Latter-day Saints and broader Mormon culture. In March, the band was nominated for two Grammy Awards, followed in April with 11 Billboard Music Award nominations on the strength of their 2017 album Evolve, which hit No. 1 in three countries and featured multi-platinum singles "Thunder" and "Believer." In June, Reynolds went on The Ellen DeGeneres Show to talk about Believer's mission and his own guilt as a divorced Mormon. Just last week, the new single "Natural" was picked to serve as ESPN's college football season anthem. Those red-meat, radio-friendly accolades shouldn't distract you from the biggest event on Reynolds' upcoming calendar: the second annual LoveLoud Festival. 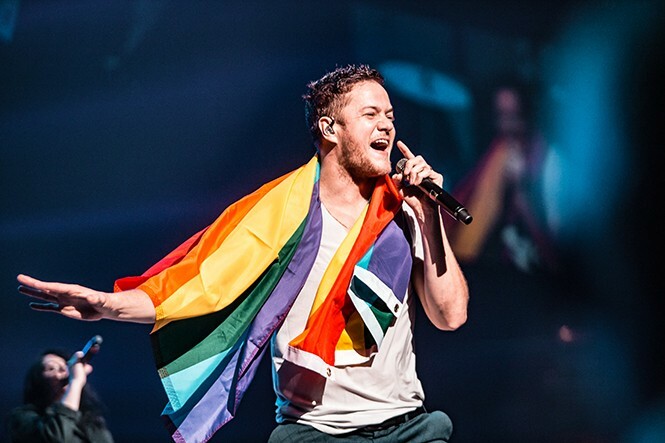 Created specifically to support the LoveLoud Foundation, which focuses on high teen suicide rates among LGBTQ youth in Utah, LoveLoud features music from Imagine Dragons, Zedd, Mike Shinoda, Grace Vanderwaal, Tyler Glenn, Vagabon and A.W. It also aims to raise $1 million for LGBTQ-supporting charities: Encircle, The Trevor Project and The Tegan & Sara Foundation, the latter of which fights for health, economic justice and representation for LGBTQ girls and women. City Weekly spoke with Reynolds and Tegan Quin about the event and its significance. City Weekly: The first LoveLoud was held in 2017 at Utah Valley University. This year it's at the University of Utah. How significant is that growth? Dan Reynolds: It speaks on behalf of the people who want to come together and have this dialogue on a bigger stage and in a bigger way. We wanted to allow space for more people to experience a day filled with love, acceptance and healing, and we're really grateful to the people of Utah for allowing us to do this. CW: Tegan, although you and your sister Sara aren't performing this year, The Tegan & Sara Foundation is one of LoveLoud's main beneficiaries. What brought you on board? Tegan Quin: We followed last year's event closely and were very impressed with how it was handled. We are on a creative hiatus right now, so we couldn't perform, but as soon as I talked to Dan about what he wanted to accomplish, I bossed my way into being involved. The work that's being done by this passionate, credible team at LoveLoud is really inspiring. I feel compelled as an artist to speak out and use my privilege to help where I can, and this cause is so important to Sara and I. A lot of legislation has passed to make LGBTQ people happier, healthier and safer. But there's still so much to do, especially in these pockets of religious communities, with leadership, mentorship and representation. This conversation that Dan has started is so important, and we're honored to be on the front lines with him. CW: Dan, the Believer documentary details how you've worked to shift LDS thinking about LGBTQ youth. How important is your background in the church in starting that conversation? DR: Growing up Mormon, you're quick to close your door if you feel like someone's attacking or judging you. Mormons and other people of orthodox faith often feel guarded about their religion. A lot of times, the only conversations that happen come when you're talking to someone of a like faith who understands the culture. If we're going to have this dialogue, it needs to come from within. And if we're going to make change, we need all parties at the table to talk together about this part of our culture and how it's broken. Among LGBTQ youth, the suicide rate is eight times higher [than the national average], and the amount of anti-depressants in Utah is crazy. CW: Given Imagine Dragons' popularity and your own high profile this year, how do you keep the LoveLoud mission in perspective in your personal life? DR: As a human being, it's shifted the way that I see the world. As the singer of Imagine Dragons, it's absolutely shifted the culture of our band and what we stand for. Not a show goes by without someone from the LGBTQ community right in front holding a rainbow flag. A lot of our fan base comes from religious communities and red states, so even before LoveLoud started, I knew I was in a position where I could use my voice and my privilege to create dialogue where it's needed the most. When I'm holding a rainbow flag at a show in Missouri, I know there's a guy in a camo hat in that crowd thinking, "Whoa—I don't know how I feel about this." But that makes me happy. That's how change happens. That's how LGBTQ [issues] become de-stigmatized. Personally, and it makes me emotional to think about this, I'm reminded of my privilege every day. I was recently talking to a young gay friend who's part of the LoveLoud team, and he said, "I'm still scared every day when I hold my boyfriend's hand." People think we're at some place in America where LGTBQ youth are fine. Actually, no, there's still so much danger out there. Many of our youth do not feel safe at all. Lately, maybe they're feeling even more scared. That chills me. I take that personally. I've never once hesitated or felt anxious about holding a girl's hand in public. Those are the kinds of realizations I have every day. I'm still learning. But it makes me feel even more of a need to speak out and hopefully help create change.